Fish serves as a good source of protein, contains a low amount of saturated fat and provides healthy omega-3 fatty acids – necessary to support brain function while also helping to reduce the risk for chronic diseases such as heart disease, arthritis and certain types of cancer. The American Heart Association recommends eating two 3.5 ounce servings of fish per week as part of a heart-healthy diet. Some fish contain environmental contaminates such as mercury, PCBs --- polychlorinated biphenyls -- or dioxins. The healthiest fish to eat provide the highest levels of omega-3 fatty acids with the lowest levels of environmental toxins. 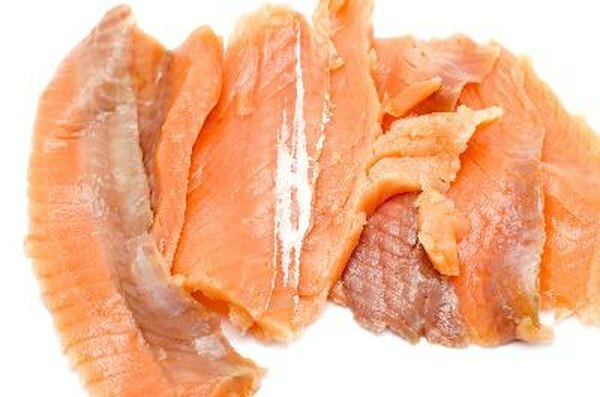 Different species of salmon are available, including Atlantic, King, Pink or Red salmon. All of the varieties of salmon are among the healthiest fish to eat. Whether fresh or frozen, a 3 ounce serving of salmon provides 1.1 grams to 1.9 grams of omega-3 fatty acids and contains only 0.01 parts per million of mercury. Salmon provides approximately one-third of the daily recommended intake of protein, with 17 grams per 3 ounce serving. Salmon also provides between 19 percent and 24 percent of the daily recommended value of calcium, depending on the variety of salmon. Salmon serves as a good source of niacin, also known as vitamin B-3, and vitamin B-12, which supports healthy red blood cells. Flounder, also known as flat fish, is also considered one of the healthiest fish to eat. A 3 ounce serving of flounder provides 0.48 grams of omega-3 fatty acid with only 0.05 parts per million of mercury. The same serving size contains 12.95 grams of protein and 0.46 grams of saturated fat. Flounder serves as a good source of calcium and phosphorus, the minerals needed to build strong bones and teeth, with 21 milligrams and 263 milligrams respectively. Flounder also contains essential vitamins including niacin, vitamin B-12 and vitamin A.
Pollock, a member of the cod family of fish, comes in a variety of common species including Atlantic Pollock and walleye Pollock. A 3 ounce serving of Pollock contains only 0.06 parts per million of mercury while providing 0.45 grams of omega-3 fatty acids. Pollock also contain 21.18 grams of protein per 3 ounce serving. Like other fish species, Pollock also serves as a good source of calcium, with 65 milligrams per serving, and phosphorus, with 241 milligrams per serving. Eating Pollock also helps you meet your daily recommended intakes of niacin, vitamin B-12 and vitamin A.
Tuna comes in many different varieties, some of which contain higher levels of mercury, so it should be avoided. The healthiest variety of tuna to eat is canned light tuna. This type of tuna contains between 0.17 grams and 0.24 grams of omega-3 fatty acids and 0.12 parts per million of mercury. Although higher than the other fish choices, this level is still considered acceptable even for children and pregnant women. Albacore tuna, such as that found in the canned white variety, contains a higher mercury content and should not be eaten more than once a week, according to the Washington State Department of Health. Tuna steak from bluefin, bigeye or yellowfin varieties are high in mercury and should be avoided. A 3 ounce serving of canned light tuna contains 21.68 grams of protein, only 0.19 grams of saturated fat and a high content of niacin, with 11.28 milligrams. Due to its mild flavor and low cost, catfish has become one of the most popular fish consumed in the United States. Although considered one of the healthy fish, the fat content of catfish has become an area of debate in recent years. Catfish does contain the heart-healthy omega-3 fatty acids, but the levels are lower than other fish, with only .22 grams to .3 g per 3 ounce serving. Catfish also contains a low risk of mercury with only 0.05 parts per million. The debate around catfish centers upon the level of omega-6 fatty acids. Omega-6 fatty acids play an important role in supporting brain functions, but they may induce inflammation – a trait that makes it less desirable than the omega-3 fatty acids.